Meet our kitty Boca. Boca is a crazy 10 year old tabby cat with a split personality that we adopted from a local animal shelter. Don’t let his cute face fool you, he’s full of trouble and quite the ornery little fella with a touch of crazy. If you walk around the house at night be careful because out of nowhere you’ll hear the patter of paws running and all of the sudden he’ll grab on to your leg and before you know he’s gone again, it scares the bejesus out of me everytime. But, he’ll also be a pillow pet and lay next to my head snuggled up at night. He’s very sweet and sour and we love him. One thing we certainly do not love is the smell of litter. We’ve tried all different kinds of litter to help eliminate the smells and have found some that are decent but Boca is also very picky when it comes to his litter. If he doesn’t like it he’ll just poop on the floor…gross! So when I was offered to review Arm & Hammer Ultra Last litter I happily accepted to put it to the test! I use many Arm & Hammer products in my home from their laundry detergent to baking soda in my fridge to get rid of yucky smells and it works wonders. So, I had high hopes that the Ultra Last litter would help to get rid of the cat odor in the litter box too. Being that Daddy Digger and I both work we don’t always have time to scoop out the litter boxes and Ultra Last claims to work even when scooping has to wait. Each of the granules in Ultra Last are coated with Arm & Hammer baking soda and it contains powerful odor eliminators. It has a fresh scent and it’s moisture activated so it deodorizes throughout the day. How Well Did Arm & Hammer Ultra Last Work For Us? Boca has a couple of litter boxes so we filled one with the new Arm & Hammer Ultra and the other with our old litter to really get a good comparison of the two. The Arm & Hammer Ultra really did a great job of getting rid of the awful ammonia smell. Arm & Hammer Ultra Last states that it “Works Even When You Scoop!” and well, it did! When scooping the litter the usual cat pee smell was gone and made scooping just a little more pleasant. It created solid clumps of cat pee and poop so the litter box was easy to scoop clean. Arm & Hammer Ultra Last has worked very well for us, we no longer have to scoop as often and there is no odor in the basement where we keep his litter boxes. 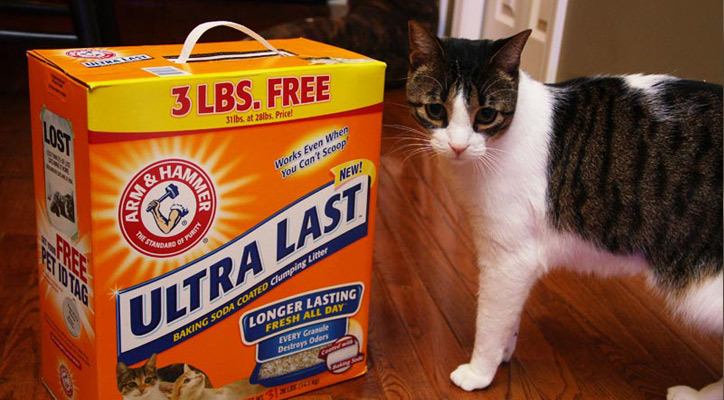 Ultra Last is certainly another Arm & Hammer product that I love, if you have a cat in your home I would definitely recommend it. Arm & Hammer Ultra Last cat litter is available at all national Target and Walmart stores. I picked up ours at one of my favorite stores, Target. Visit www.ultralastlitter.com to learn more and get a rebate to try Arm & Ultra Last for free! I wrote this review while participating in a blog tour by Mom Central Consulting on behalf Arm & Hammer and received a product coupon to facilitate my review and a promotional item to thank me for taking the time to participate. We use regular clay litter. This sounds great! We might have to give it a try! I tried this cat litter one time before and I really liked it! I am going to buy it again soon. Thanks for the review!! I hadn’t heard of this litter. I think I’ll try it for my cat Gigi. Thanks for the review. Love Arm & Hammer – works the best! I always buy Arm&Hammer anyway; now I’m going to try the Ultralast (which I didn’t even know about until now). this is probably a really good cat litter because arm and hammer is a trusted brand. thanks for the review! I decided to try this product because a salesperson at Petco recommended it. I found that it does not clump well at all; every time I would scoop, the clumped urine would immediately unclump and sift right through my scooper. When I went to clean out the litter box, the smell of ammonia and chemicals that arose was unbearable!! I had to leave the room. When I came back, I had to hold my breath while finishing emptying the litter box. This product cannot be safe to use! ive only had my kitty for 2 months and have gone through soo many different litter brands and just recently switched to arm and hammer and i think i found the one!